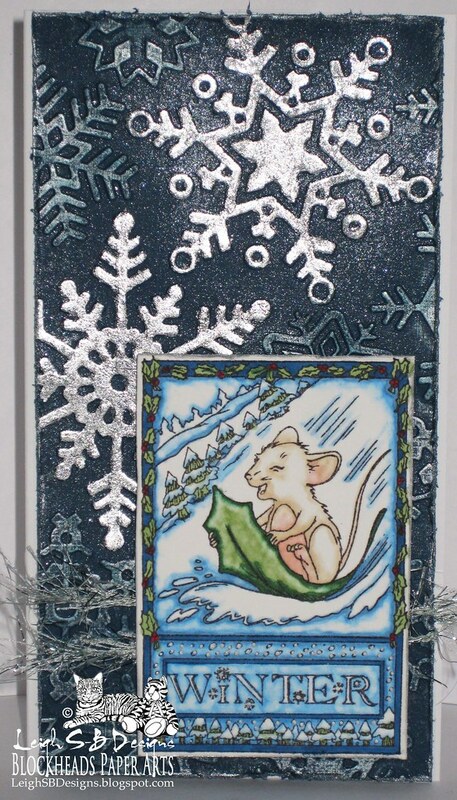 Velvet Paw Creations: Winter Hearth Mouse Christmas Card for Blockheads Paper Arts! 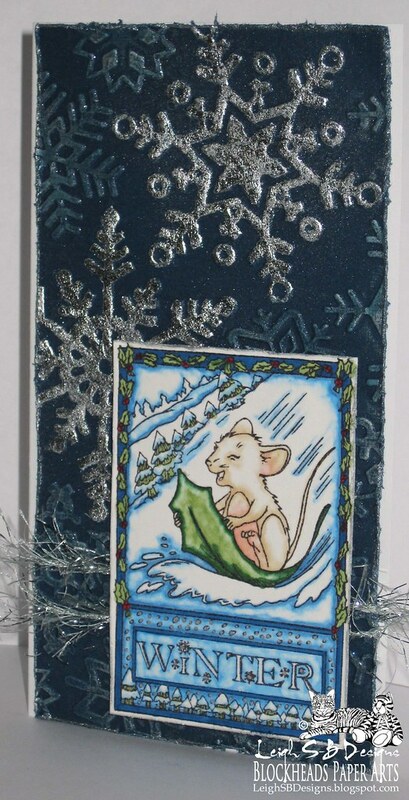 Winter Hearth Mouse Christmas Card for Blockheads Paper Arts! I hosted Blockheads Paper Arts Technique Challenge for the month of October called A Compendium of Leafing Techniques and featured 6 different techniques. The snowflake background on this card was one of the techniques and as promised here's the card I made using it. You can see how I created the background using a snowflake embossing folder by Cuttlebug, silver leaf and metallic rub-on creme here. From there I spritzed it with Vanilla Smooch spritz for even more sparkle and distressed the edges of the panel with Tim's paper distresser tool. Besides my absolute favourite tool which is rubber stamps of course, I do use embossing folders and Tim's paper distresser tool a lot, especially this year for sure! Then of course my other two absolute 'must have products' was used...inks and Copics ;0) Blockheads' whimsical Hearth Mouse (which is the larger of the two 'Winter' stamps) was stamped onto Neenah Solar White cardstock with Tuxedo Black Memento ink and coloured with Copics Sketch markers and I used the Colourless Blender for blending, removal of colour and to create the mottled effects. I trimmed around the image leaving just a narrow border and distressed the edges of the panel with the paper distresser tool then edged it with Brushed Pewter metallic Distress Stain...also one of my new favourite products this year ;0) I embellished the snowflake panel with ice blue and silver eyelash fiber and adhered the mouse panel to it with pop dots for even more dimension. I finished off by adhering everything to a narrow folded card made from white cardstock that was slightly wider than the snowflake panel. I'd give you the dimensions of the finished card but I forgot to take them before sending it off! I love this little Hearth Mouse...he pops up on a few other Blockhead Stamps also!! This is a wonderful card love the snowflakes!! Thanks for joining our first challenge at Christmas at Sweet Stampin. Gorgeous background made with stunning technique Leigh. The mouse is adorable. Thanks for sharing this card with us at Fashionista Challenge. Fab card Leigh! I love the embossing and the fun, whimsical image.